Based in Germany, SGR client Ritter-Pen has been designing and manufacturing pens and pen parts since the 1950s. We talked to the company`s Managing Director , Arno Ritter, about how its product line and technologies have evolved over the years and what initiatives the firm has taken to protect its designs and intellectual property. Arno Ritter: Ritter was founded in 1928 by my grandfather, Jacob Ritter, who was a joiner and cabinetmaker. The company crafted handmade furniture until 1964 and, during WWII, manufactured wooden boxes for the Red Cross. Because of this work, my grandfather was lucky enough not to be drafted into the German army. Ritter started manufacturing pens in the 1950s using the latest mold injection and retractable ballpoint technologies from the United States. At about the same time, we started producing pen parts for well-known companies like Faber-Castell, Geha, Pelikan, Schwan, Staedtler and Rotring. The 1960s was the era of the felt pen and the fine-liners. In the 1970s, using technologies introduced in Japan, we started making roller-ball pens. Ever since, we have manufactured more and more fully assembled pens for the corporate promotion markets. During the 1970s and 1980s, our export business rapidly expanded and Ritter became a well-known name in the industry. We offer silkscreen, pad printing, etching and laser engraving. During the past 12 years, we have opened offices in the U.S., Poland, Czech Republic and China. We sell around 100 million pens annually in 80 different countries. Each year, we develop and launch two or three new pen models. TTL: The pen industry is very competitive. How are your pens different and/or better? There are several ways. First, we make attractive pens with unique features, such as spring clips that never break. We also offer a complete range of promotional pens, so we are a one-stop resource for our customers. We have options at every price level and we continuously develop new designs. 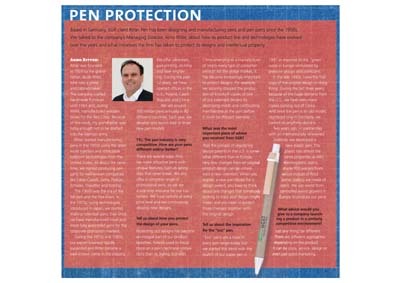 Tell us about how you protect the design of your pens. Protecting our designs has become an integral part of our product launches. Patents used to focus more on a pen’s technical innovations than its styling, but with China emerging as a manufacturer of nearly every type of consumer product for the global market, it has become increasingly important to protect designs. For example, we recently stopped the production of knockoff copies of one of our patented designs by destroying molds and confiscating merchandise at the port before it could be shipped overseas. What was the most important piece of advice you received from SGR? That the process of registering design patents in the U.S. is somewhat different than in Europe. Very few changes from an original product design can be considered a new invention. When you register a new pen model for a design patent, you have to think about any changes that somebody looking to copy your design might make, and you need to protect those changes together with the original design. Tell us about the inspiration for the ´´ eco pen. “Eco” pens are a must in every pen range today, but we started this trend with the launch of our paper pen in 1991 in response to the “green” wave in Europe stimulated by pressure groups and politicians. In the late 1990s, I saw the first copy of the original design in Hong Kong. During the last three years, because of the huge demand from the U.S., we have seen many copies coming out of China. And since the pen is an old model, registered only in Germany, we cannot do anything about it. Two years ago, in partnership with an internationally renowned institute, we developed a new plastic pen. This plastic has almost the same properties as ABS thermoplastic, but is made 100 percent from wood instead of food (other plastics are made of corn). We use wood from controlled wood growers in Europe to produce our pens. What advice would you give to a company launching a product in a similar competitive environment?